more millions of Germans were expelled from lands they had inhabited since the 13th century. from the villages and camps and marched a short distance away, shot and buried in mass graves. ordered to leave the beds made with clean linen. It was efficient, well-planned and organized. obliterate the ethnic memory of Germans was degrading and often fatal. shot, as were many of the victims afterward. after the War's end as died during five of the War itself. labor in the Soviet Union from the German territories annexed de-facto by Poland. reunification: some or nothing at all. 1.On July 14, 1945 from 6 to 9 oclock resettlement of the German population will take place. 2.The German population will be resettled to an area west of the river Neisse. 3.Each German is allowed to take 20kg of luggage with him at the most. 4.No means of transportation (wagons, oxen, horses, cows etc) is permitted. 5.The total of the living and dead inventory in an undamaged state remains the property of Poland. 6.The last resettlement deadline will terminate on the 14th of July at 10 o’clock. 7.Noncompliance with this order will be punished severely, including the use of weapons. 8.Sabotage and looting will also be prevented by the use of weapons. marching column. The head of the column is to be 20 meters before the village of Adelsbach. dwelling with their family members from 5 o’clock to 14:00. 11.All dwellings in the city must remain open; all apartment and house keys must be left outside. was largely destroyed. The medieval parts of the city and almost all historical landmarks were gutted. was a murdered, disfigured or disemboweled German hung on every lamp post in the city. administration. Most surviving German inhabitants were expelled and all German property was taken. and the real history of the city. Renamed "Wrocław", it was resettled with Poles. 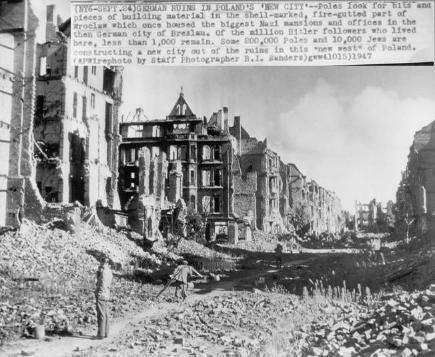 terror while others fought on desperately for days until the city finally fell on May 6, 1945.
the last major city in eastern Germany to fall on May 7, 1945.